Note: Click to see maps of the Second Battle of Reams Station, which should help you follow along with the action. Brief Summary: One hundred and fifty years ago today, on August 25, 1864, the Second Battle of Ream’s Station was fought between portions of Hill’s Confederate Third Corps and portions of Hancock’s Union Second Corps and Gregg’s Cavalry division. The First Battle of Reams Station, in which the Confederates tried to trap a good portion of the Union cavalry returning from the Wilson-Kautz Raid, was fought on June 29, 1864. The recent Union victory at the Battle of Globe Tavern from August 18-21, 1864 closed off the Weldon Railroad in the vicinity of Petersburg to Confederate use. Ulysses S. Grant was not satisfied and wanted to deny its use to Confederates for a considerable distance to the south. To accomplish this, he again tapped Winfield Scott Hancock’s overworked Second Corps for another hard job. Hancock’s men had just been involved in the Second Deep Bottom Campaign from August 13-20, 1864, and had not recovered from the effects of marching in intense heat with little water. David Gregg’s cavalry division was added to Hancock’s force as a cavalry screen. Barlow’s Second Corps division, commanded by Nelson A. Miles in his absence due to sickness, joined Gregg’s cavalry in tearing up the Weldon Railroad south from the Fifth Corps position at Globe Tavern, and were within a few miles of Ream’s Station by the end of the day on August 22, 1864. Gibbon’s division occupied earthworks protecting Ream’s Station on August 23. These defenses had been thrown up earlier in the siege by Union cavalry during the Wilson-Kautz Raid. The Union soldiers continued to tear up track, reaching several miles south of Ream’s Station by evening of August 24, while also keeping an eye out for any expected Confederate interference. That interference came on August 25. Hancock still had five miles of railroad to tear up before he had accomplished Grant’s instructions in full, but he pulled his force back to the earthworks when he heard Confederate cavalry was in the vicinity. Before discussing the Confederate attack, we should take a step back and review these earthworks, because they played a key role in the battle. As you can see on the Official Records map below, these breastworks were in a U shape, with the bottom of the U facing west (north is to the left on the map, and is also the direction you’d take to get back to Petersburg via Globe Tavern). There were two main issues with the way these fortifications were set up. First, the bottom of the U lay just over the railroad tracks of the Weldon Railroad, making it difficult if not impossible for an artillery to limber up and leave if the situation dictated. In addition, the line bent too far back on itself, so the legs of the U were too close together. Shots fired at troops manning the north leg could hit those manning the south leg in the back, and vice versa. The Confederates approached from the west, and launched their first attack around 2 in the afternoon. 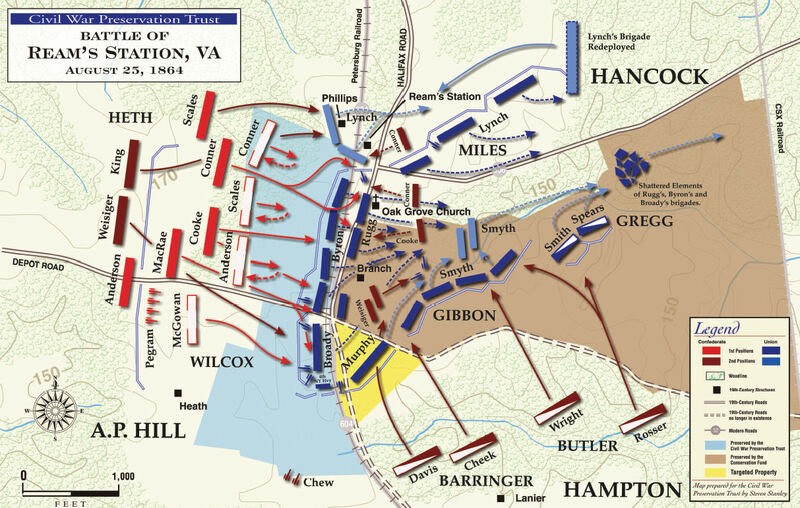 Portions of Wilcox’s Third Corps division hit the right (or northern) flank of the U manned by Miles’ division, while Hampton’s cavalry attacked Gibbon’s division manning the left (or southern) flank. Both of these attacks were defeated, but the Confederates were only getting started. Portions of Heth’s and Mahone’s divisions also arrived, giving A. P. Hill a good portion of his entire infantry force. After Willie Pegram’s artillery pounded the Union position, seven infantry brigades and four cavalry brigades mounted a combined assault around 5:30 in the afternoon which crumpled Hancock’s line and caused a rout. Despite local efforts at counterattacks to reverse the tide, the Union Second Corps and Gregg’s cavalry were pushed east and forced to retire. Meade had tried to get reinforcements to Hancock in the form of Mott’s division of the Second Corps and Willcox’s Division of the Ninth Corps, but they took a route out of the way rather than straight down the Weldon Railroad from Globe Tavern for fear of being ambushed. They arrived too late, and the Second Corps had suffered an even worse defeat than at Jerusalem Plank Road in June 1864. Hancock’s troops needed a break, as did Hancock himself. Despite the Confederate tactical victory, the battles around the Weldon Railroad resulted in a Union strategic victory. The use of the Weldon Railroad was denied the Confederates anywhere north of Stony Creek, and supplies would have to be hauled from that point to the Boydton Plank Road and finally into Petersburg. It was a serious if not crippling blow to Confederate logistical efforts. Major action would slow down for a while as both sides rested and regrouped from the major action in mid-to-late August 1864.